The stage is set for yet another Supreme Court showdown. After a successful stalling on the part of Republicans, President Donald Trump was able to appoint Justice Neil Gorsuch to the bench in 2017, and now he’ll have the chance to do it again. Our politics and our discourse are toxic and folks on both sides of the aisle are unwilling to budge from their party orthodoxy, it seems. So when Supreme Court Justice Anthony Kennedy announced Wednesday he is retiring, he threw our political world into a tailspin. “This didn’t start just yesterday,” Wear said, noting the way Senate Majority Leader Mitch McConnell (R-Ky.) successfully filibustered then-President Barack Obama’s nomination of Judge Merrick Garland in 2016 as well as former Senate Majority Leader Harry Reid’s (D-Nev.) 2013 rule change lowering the threshold of votes necessary to approve a presidential court nominee. “At what point does it stop?” Wear asked. Wear, who served as a faith adviser to Obama both in the White House and on the campaign trail, even had a tip for his fellow Democrats. He urged those on the left to wait until Trump nominates someone, a decision expected on July 9, before pledging their “outright opposition” to him or her. He then suggested the moderate senators of both parties — those like Sen. Heidi Heitkamp (D-N.D.) and Sen. Bob Corker (R-Tenn.) — work together to “restore a sense of balance” to the Supreme Court nominating process. Maybe such a cooperation would stop politicians like Sen. Dianne Feinstein (D-Calif.) from suggesting a nominee’s religious background renders him or her unqualified to sit on the high court. After all, in 2017, she grilled court nominee Amy Barrett over her Catholic faith. If the same politicization and demonization that burdened the nominating processes in the not-so-distant past rears its head again, the American electorate should brace for even more toxicity this go ’round. And from the looks of it, sadly, Americans should probably start bracing now. On Wednesday, “Daily Show” host Trevor Noah fully embraced the complete politicization of the Supreme Court while at the same time allowing politics to entirely eclipse faith. To Noah, it appears, everything is tied to politics. 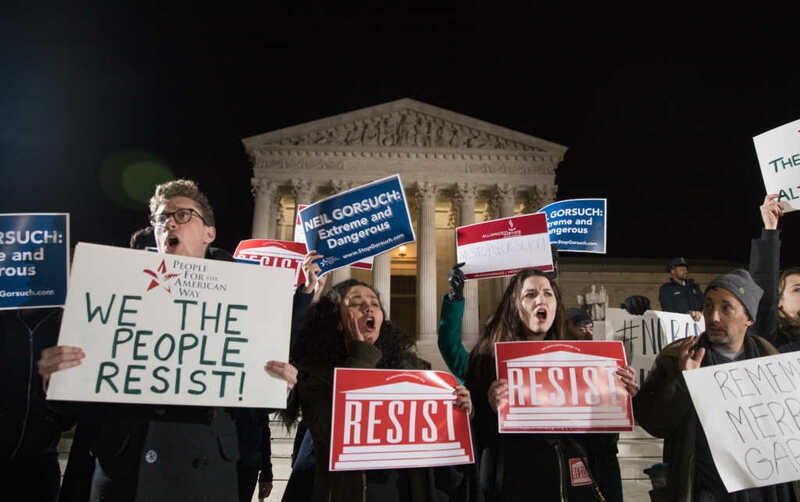 Should things not begin to shift toward bipartisanship, he said, the country is “headed toward a pretty significant fight” over the impending Supreme Court battle.